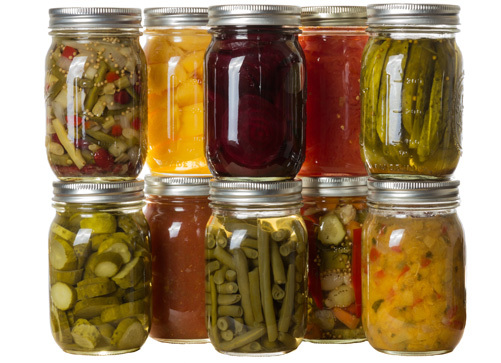 Quantity: An average of 11 pounds is needed percanner load of 7 quarts; an average of 7 pounds is needed per canner load of 9 pints. A bushel weighs 26 pounds and yields 16 to 18 quarts – an average of 1-1/2 pounds per quart. Quality: Select young, tender pods. Remove and discard diseased and rust-spotted pods. 2. Wash pods and trim ends. Leave whole or cut into 1-inch pieces. 3. Cover with hot water in a saucepan, boil 2 minutes and drain. 4. Add 1 teaspoon of salt per quart to the jar, if desired.Fill jars with hot okra and cooking liquid, leaving 1-inch headspace.